This recipe came to me in 2018 on Fathers Day…we had a family shindig for the dads (and uncles who have been fill-in dads) and for the moms who enabled their men to become dads. Anyway, I kind of organized this mid-afternoon swim party/early dinner and signed up for bringing barbequed chicken, beans and slaw. Others were assigned beverages and paper goods and my daughter said she’d make these bars. 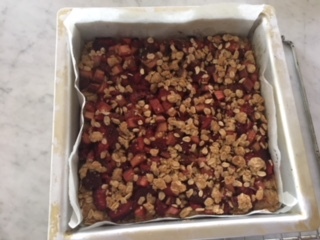 If I had seen the recipe published, I’m not sure I would have headed immediately to the store to get the ingredients or that I would have swooned over the idea of these bars. HOWEVER, I tasted them and I was hooked from the first bite. They originate from One Bowl Baking, although I made many changes in amounts, method, ingredients, baking time — even the way to ensure they are gorgeous when cut…so I can almost call them my own. The same week as father’s day, I made these EVERY DAY. 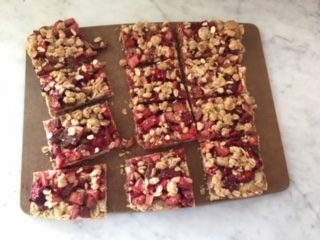 Arguably, some went to a family with a new baby, a few went into the freezer but the majority of these little bars are in my stomach (and my husband’s stomach too). I became obsessed with making them perfect (I do love things to taste great AND look appealing) and I tried lots of tweaks. Below is what I decided is the perfect bar. Now I plan to try this with different fruit (blackberry/cranberry? Apricot/blueberry? The sky’s the limit. I cut mine into beautiful little rectangles and store them in the freezer long term and in the fridge short term. Preheat oven to 375 degrees with rack in the middle of the oven. Line an 8 x 8 metal brownie pan with parchment paper (cut to about 8 x 12?) – leaving some of the paper extending over the sides in one direction and put a second sheet of parchment going the other way with paper extending up the sides as well. I take my fingernail to be sure the bottom edges and corners of the paper won’t slide about and I spray the paper with Pam. Dice up fruit, stir in orange juice, zest and cornstarch and mix well. Let it remain on the counter while you make the bottom crust and top crumble. Stir it again when you walk by. Mix together the oats, flour, brown sugar, and salt and dribble in the butter, mixing everything together with your hands. (This is a great job for little people too). Remove a little less than ½ cup of this crumble. Press the remaining flour/oat mixture for the crust into the bottom of your brownie pan. I make sure everything is even steven, then I press it down firmly using an offset spatula. or bench scraper. Top with the fruit mixture and make sure this layer is even. Top with crumbs of the crust-making sure it doesn’t stick together in clumps. I then lightly press down on the topping with my hands. Put into the preheated oven and bake for 42 minutes (look at 35 minutes-it should be browning). Remove from the oven when it is brown and smells delish, and let the pan cool on a rack for a half hour or so. Put the entire pan, when cool to the touch, in the refrigerator for at least an hour or even overnight. Remove the bars gently from the brownie pan, using the parchment paper. Peel the paper away and put the mass of uncut cookies on a cutting board. Cut into 12 nice pieces (4 rows down and 3 across) with a sharp, long knife. Keep these stored in the fridge for up to 5 days or in the freezer for up to 3 months. Repeat as long as you can get tender, fresh rhubarb, and nice strawberries. 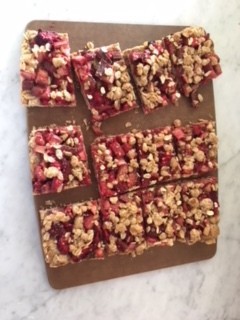 This entry was posted in Dessert and tagged Rhubarb Strawberry Bars. Bookmark the permalink. Hi Marilyn! These look delish. A nice break from chocolate 🙂 If I wanted to use a 9×13 baking dish, how would you adjust quantities? Double the amounts, like with many other bar recipes, or …? Hope all is well with you, Wayne and your beautiful family! !